During Computex 2018, Asus has announced an all-new type of Ultrabook laptop known as the Asus ZenBook S, or UX391. 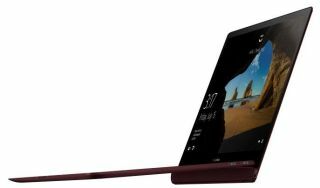 The laptop looks like a Surface Pro at first glance, thanks to a unique hinge design, but isn’t like that Windows 10 tablet at all. That interesting hinge is known as the ‘ErgoLift Hinge,’ and it raises the angle of the laptop base and therefore the keyboard when opening the laptop. This is because the hinge is positioned a bit above the edge of the laptop lid. The ErgoLift Hinge gives the keyboard an angle of 5.5-degrees, which Asus claims to have found during research promotes comfortable typing for longer periods of time. This solution also allows heat that the 0.51-inch thin laptop generates to be dissipated through the bottom of the base while (theoretically) escaping before it warms up your legs. Better yet, Asus promises that this angle also allows the bottom-firing speakers on the laptop to shine far better than competing, normal laptops. Plus, a smart amplifier adjusts the max volume, accounting for the acoustics created by the angle, to deliver the best battery life and quality. Of course, being an Ultrabook, the ZenBook S is armed to the teeth with high-end parts. That includes a 13.3-inch touchscreen with ultra-thin, 5.9mm bezels and a resolution of either 1,920 x 1,080 or 3,840 x 2,160. Asus’s Tru2Life video technology enhances either screen’s contrast, sharpness and playback smoothness through pixel analysis. Despite the thinness of the laptop, Asus managed to cram one USB-C 3.1 port, two USB-C Thunderbolt 3 ports and an audio jack for plenty of expandability. A touchpad-embedded fingerprint sensor is also included, ensuring this laptop is packed with hardware. Asus promises up to 13 and a half hours of battery life from the ZenBook S when it launches on June 11 for $1,199 (about £899, AU$1,569) on Amazon and at B&H Photo in the US.